Looking to complete your place of worship? 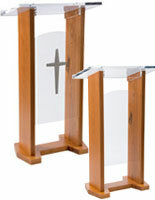 These wooden cross podiums come in both traditional and contemporary designs to match any church. Our pulpits feature a crucifix printed or mounted on the front to help get your message across. We offer wooden cross podiums with a professional design that looks great in front of any crowd or service. 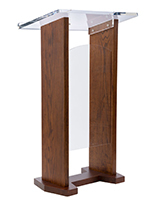 In addition, our lecterns come in an assortment of styles to meet any congregation's needs. 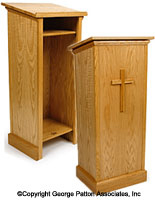 Browse our wide selection of wooden cross podiums to find the one that's right for you. What kinds of church pulpits do we sell here? Our traditional wooden cross podiums are made of wood and feature a mounted crucifix on the front panel. This subtle design is excellent for old-fashion houses of worship, and has a single-tone design that won't distract from the service. Additionally, these traditional presentation stands have a private shelf for storing books and other supplies, as well as a completely opaque privacy panel. 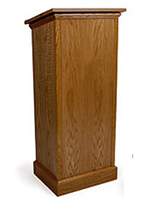 These wooden podiums are fabricated with solid oak and plywood and require minor assembly. This line is sold in three finishes: light, medium and dark to complement any church. Our other series of wooden podiums features a modern style using acrylic panels and a printed graphic on the front. These models are available with a number of different crucifix styles. This includes traditional, celtic, trinity and Orthodox crosses, as well as ones with praying hands. Find the graphic that best matches your denomination with our large selection of symbols. Some models come with 1-color printing in a shade of your choice to fully match your theme. Our other models have clear interchangeable front panels, one with a logo and one without. 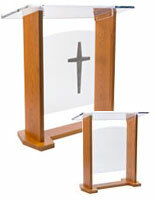 Use these modern pulpits to give your place of worship a more contemporary appearance. Why buy lecterns from Displays2go? Our presentation stands are easy to put together and come with assembly instructions for convenience. These wood pulpits, like the rest of our catalog, ship quickly to supply your church as quickly as possible. In addition, they benefit from wholesale pricing for bulk orders.